Unless you’re a president of some nation or the leader of some over-achieving guerrilla faction, rarely do you get the chance to put the world on stop. To have had this mission in the 80s with music featuring black artists, when up until 1983 the Billboard music chart gods, for instance, had filed most of the music by black artists as “Black” Singles, Records, etc., is nothing short of remarkable. And I miss his era. Look, I’m not gonna get all “there are X-number elements of hip hop” or “I know real hip hop” with this. Hip hop (“HH”) is a wedding reception celebrating the marriage of soul and inner city blues.2 And, like at any wedding reception, you’ve got all sorts of different people at different tables. There’s a table for the wedding party; and a table for the cousins you don’t really remember; and one for your coworkers that insisted on being there, etc. But it’s not a secret that something’s missing lately. And I don’t know what it is. It’s like: friends – check; money – check; soundboard – check; microphone – check. But while I totally think a bunch of these young artists should get paid if they can, you can’t convince me that doing the stanky legg is anything like It Takes Two by Rob Base and DJ EZ Rock. I was watching the 2009 Hip Hop Honors last night and Lyor Cohen was telling the story of how he decided to sign Warren G — most known for Regulate, a track with a famous Michael McDonald sample — to Def Jam. Cohen said he walked in to Warren’s house and there was barely any furniture; a TV and one chair, basically. But when Warren took him to the space where he made music, Cohen looked down at his turntables, saw a copy of Carole King’s Tapestry spinning and knew this was the kind of guy he wanted to sign; someone with versatility who wasn’t afraid to like good music and not care who made it. And that’s what I miss. I miss the almost tangible sense that HH artists were multifaceted fans of music; that they appreciated sounds they “weren’t supposed to” like; that they found a way to convince us that these were sounds they were supposed to like. Because at the end of the day, all of our talk about what “real men” listen to, or white people listen to, or older generations really “get/understand,” is nonsense. It’s just about whether it’s good music. It really is that simple. 1Great article, though now dated, about Rubin here. 2Just an “oh, by the way,” but one of the best songs ever: Marvin’s Inner City Blues (Make Me Wanna Holler). 3I kid, Souljah Mom. I kid. ¡Bienvenidos a Free Verse Friday! It’s the day when I share something different than banter and prose and hope it reads wherever you are as it sounds when I hear it, here, on my side of the interwebs. It breaks my heart, but I’m not paranoid about this. This isn’t systematized delusion. I’ve been told this, quite frankly, by many people shockingly unafraid to admit they thought so. And so any, and every, time I step out my front door – literally at home, figuratively on this blog – I wonder how I’ll be perceived by my own. Because it’s stupidly unfortunate, but I don’t consider it a fair choice to choose to ignore it. It certainly isn’t that I consciously try to respond to situations “blackly;” again, that’s a fallacy: it can’t be done. But I do measure observations of my self in the eyes of people. I take notes. And so this feeling reared its head last Friday, and I panicked that someone would consider that line I wrote indicative of everything they had come to believe about me: a guy uninterested in being in line with his race. I took it down because the silence was maddening. I had posted the link on clandestine-stalker-haven Facebook. Those of you who read this blog regularly know my advocacy. But what were other people thinking? Who read it? Had I just solidified a reputation I’d never be able to escape? I still don’t know those answers. Nonetheless, I soon decided I like my reputation as someone willing to honestly present his self as he sees himself, even in the face of challenge, just fine. And so I hope the writing below doesn’t seem like a cop out. It’s something I wrote during college when a girlfriend said she needed to perform, on behalf of her sorority, a poem honoring black men. I was her ghostwriter. Posting it is not an attempt to appease anyone who doubts my “allegiance to the cause,” but instead a chance to pound my chest as affirmation of the person many judge too quickly to see. It’s not that long; so if you read it, thanks. But if not, I’d still love to hear from you today. Help me make this post more than just my own story. I’d love to know about a group or class of people you’re a part of. Have you ever felt uninvited despite so clearly wearing the membership card across your chest? Not feminine enough… Not masculine enough… What have you done when those like the you you can’t change tell you you aren’t them? from the doorway to your table. i’ve seen you in my dreams. and its inability to honor the beauty in our imperfections. that no dose of depression cures oppression. and i smile through the tears. of his own pomp and circumstance? so well they don’t even know it’s an act. so this is your award. but you can wear it on your soul. our daughters will always understand. It is Free Verse Friday (FVF), but first I want to thank all of you for yesterday. It wasn’t my moment, and so it feels selfish to admit how much it mattered to me. But it did. And if you plan on being at Marvin tonight around 8, I’ll thank you in person. But the business… Yesterday, I promised today would be a conclusion to that entry. And it is. This is an excerpt of something I wrote about a year ago. If you want the whole thing, I’d be honored to email it to you. If you know me, I’m one of the quintessential child of divorce types: I don’t think I’d make a good dad, afraid I’d… I don’t know. It’s irrational. And it works itself out irrationally; like with this excerpt, one of many things I’ve written about what it would be like to be a dad. These few words are about what I’d have to say to a son to explain to him the world he’s inherited. Because whenever he’d become real, that would be it. That would have been the best I could do, as far as making him a better world is concerned. There’d be no more prep time. And in light of the cartoon from Wednesday, it’s obvious there’s a lot to be done before I could proudly answer the questions I imagine he’d ask. Thanks for stopping by. Looking forward to seeing as many of you as can come tonight. just in case she reads. no, wait, no: that’s a lie. a pair of sturdy boots. fails to give them sight. knows not the trouble i’ve seen. I’m sure he’s a good guy. And by “sure” I mean he’s probably not, but I can’t prove it, so I’ll benefit-of-the-doubt him for the time being. I’ve never seen more than a trailer for any of the movies. So the following might be a little premature and woefully ungrounded: I bet I’d feel marginalized, rather than celebrated. Being marginalized is generally unwatchable. Not necessarily in the “I wouldn’t watch it intoxicated” way. I mean, I did see and surprisingly like Soul Plane after a few drinks, and discovering Kevin Hart has worked out pretty well. Hey! It’s like “Ernest,” but for black people! I know this multiple character thing is popular. Since 1996, I’ve passed a lot of people on the street, wondering whether Eddie Murphy is somewhere deep inside, buried beneath layers of synthetic skin and makeup. But it’s not that funny. And it’s certainly even less funny when it takes itself seriously. Tyler Perry’s stream of consciousness is signed, sealed and delivered as the look into “black life” that the rest of Hollywood ignores. It self-elevates. … screwed us all; the whole freaking rainbow of us all. It made us all caricatures of what we actually are. 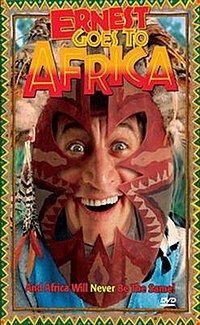 Ernest went to Africa in 1997, and all he found was that mask? And unlike any minimally informed, “I can get by”-literate person, he insisted on imposing his shenanigans so that “Africa [would] never be the same” and couldn’t even identify one of the 53 nations, so apparently he just went to the whole continent?! Madea seems to draw us all the same way: overly dichotomous, with a hint of reverse-assimilation. ** But we’ve used that crayon before. It’s been reduced to a nub. *Awesome, though, for Jim Varney. **Where a white character, wide-eyed and hopeful, seeks to convince the cast of black characters how laid back, easygoing and tolerant she/he actually is “despite” her/his color. Maybe she/he even tries to dance a little? You know what I mean. and we’d see the other side. so why do we act like understudies? like living’s worth not wanting more? why do we assume it’s beyond our control? to shining on the brightest stage. ’cause we know what it’s like to lose. with more than arms-length transactional hugs.